Fans of the show can find out just how the heck Dan Conner is still alive when the nine-episode 10th season debuts with a special hour-long episode on Tuesday, March 27 at 8 p.m. 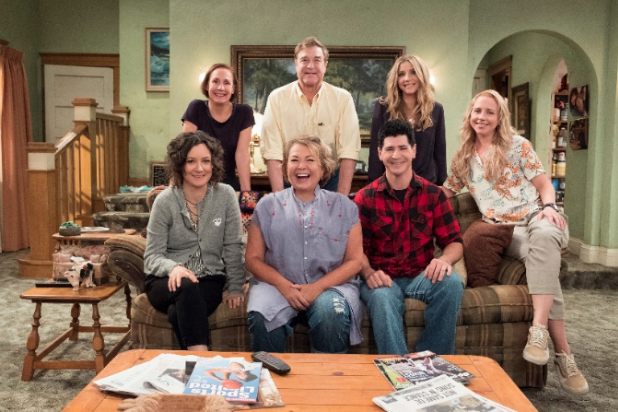 The full cast from the show’s original run is returning for the new go-round, including Roseanne Barr, John Goodman, Laurie Metcalf, Sara Gilbert, Michael Fishman, and both Beckys — Lecy Goranson, who originated the character and will play her in the revival, and Sarah Chalke, who will play a new character. Johnny Galecki, who currently stars in CBS’ hit “The Big Bang Theory,” is also returning for a single episode. Goodman’s inclusion is an interesting development since the series concluded with the character of Roseanne revealing that the final-season plot in which Goodman’s character had survived a heart attack and the family won the lottery … was all a dream. In the reality of the show, Dan did not survive the heart attack. Roseanne Barr herself had an idea about how he returns; read about it here. The show also stars Emma Kenney, Ames McNamara, and Jayden Rey.